The Olivet Discourse remains a staple test of Biblical hermeneutics, theology and eschatology. 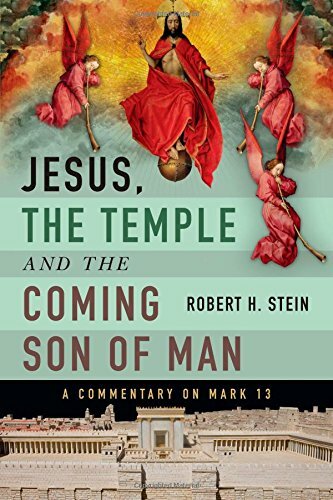 Robert Stein, a praised authority in both Biblical interpretation and the Synoptic Gospel, has lent his voice to this important discussion in Jesus, the Temple and the Coming Son of Man: A Commentary on Mark 13 (henceforth Coming Son of Man). The author of an entire commentary on Mark (Baker Exegetical Commentary), Stein provides a complete and thorough analysis of this important text in an incredibly slim volume. Coming Son of Man is a scholarly commentary. The readability of the volume depends on one’s familiarity with the text and history of Mark 13. Familiarity with these makes Stein’s footnotes and analysis of differing interpretations easier to comprehend. After an in-depth look at the history of higher criticism and authenticity of Jesus traditions (chapter 1), Stein proceeds exegetically through the entire text of Mark 13. This is not a cursory reading but a detailed look at the entire passage in the original Greek. Special attention is paid early on to determine the audience of the discourse (45-48, 73-76) between “internal context” (the disciples Jesus was talking to) and “external context” (the readers of Mark’s gospel). Since many futurist readings of this passage rely on the “external context” view, Stein’s work is an excellent defense of Christ’s words being focused on the destruction of Jerusalem and her temple in A.D. 70. Stein addresses the topic of context again by discussing the disciples’ opening questions to Jesus Christ. Stein explains how these questions are either “synonymous parallelism” (the same question voiced two ways) or “step parallelism” (different intended questions) (63-69). Through linguistics and context, Stein shows that “synonymous parallelism” along with “internal context” establishes the necessary lens for understanding Christ’s words in Mark 13. Littered throughout the rest of Coming Son of Man are fascinating insights to the “divine passive” (78), the abomination of desolation (85-93), and a thorough evaluation from a non-preterist paradigm on Mark 13:24-27 (chapter 5). Stein only drifts from the gospel of Mark when it suits his argument. He claims 1 Thessalonian is clearly futuristic, perhaps denying his own “internal context” principal, (117) while ignoring the similarity of James 5:9, on the subject of the Lord’s coming, with Mark 13:29 (which Stein merely attributes to the destruction of Jerusalem). In conclusion, Jesus, the Temple and the Coming Son of Man is a focused effort to re-acquaint readers of the Scriptures with the meaning of Christ as recorded by Mark. Stein provides a scholarly, yet condensed, approach that laymen and pastors will find extremely valuable.